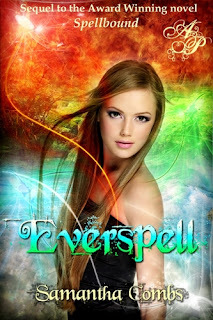 Blurb: Book Two in the Spellbound series continues the love story of Logan and Serena. Having previously dispatched Christophe, the dark demon trying to capture and kidnap Serena for her special witch DNA in Book One, the two lovers believe they are now free to plan and live their lives together. Or are they? When an innocent mistake made by their newlywed friends frees the way for Christophe to return, their idyllic attempt at happiness is marred by the nightmare they must outsmart, finally, to achieve the happily ever after they deserve. They know they can rely on their coven to be there for them, and some new friends and additions to the family, as they once again embark on an epic battle that will secure their life, their love, and their future together. Once, they were Spellbound, now their story continues, for love, forever, for Everspell. Review: The continued story of Logan and Serena is amazing. At first they and the rest of their family/coven thought they had gotten rid of the demon who tried to kill Serena, but they were wrong. In this story they have to face a lot more to stay alive and together. There are so many things that happen in this story such as a marriage that was kept in secret, a pregnancy that no one knew about and with all of that going on they have to figure out a way to make demon Chris gone forever! Logan's and Serena's love survived the first time but can they do it again with a lot more going on? You never know where the author is going to go with the story and I am so happy she went about it the right way. Everyone has a up hill battle they have to go through and it makes you wonder if everyone will live through it and how people can keep secrets. Not to mention the return of someone else! I am in love with this series and I can only hope that Samantha will bring us more of Logan's and Serena. This book, this series is a must read for anyone who want to know what true love can concour and if everyone you love can survive. Never fear, there will be a third book! I even have a title, but I'm keeping it under wraps. Your review made me giggle like a fool. I am just so glad it did all it was supposed to do for you. Thank you for your time and this most excellent review.